Its a bit of a tradition on Plymothian Transit to look ahead to the new year and make predictions as to what we can expect to see. 2013 is no exception and this will come in the next day or two. The other part of this tradition is my looking back at the predictions I made last year and seeing how well (or not!) I did! As I type these words I have not even looked back to see what they were so I have no idea how well I did. 1. The new livery will continue to be rolled out across the fleet, at a faster rate than we have seen so far. Well how to score this one? The new livery is indeed rolling out at a faster rate than we have seen for a few years but its a different livery to the one I was talking about! The two tone red livery didnt last long at all and we now see the red with white swoop livery taking over in Plymouth. 1 point I think! 2. New buses for Citybus. OK so I am cheating here a bit as we already know that we are getting ten new Volvo / Wright single deckers in the Spring. These will be launched with quite a fanfare (I hope) and will make quite an impact on Plymouth. I am guessing that they will be numbered 101 onwards to start a new series and maybe they will even do ‘an Oxford’ and have select ‘PCB’ registrations. Well maybe not that last one! OK so this was cheating to a point but I was right about the fleet numbers! I was joking about the Oxford style registrations – this is Plymouth – we dont do that here! 1 point. 3. The Citycoach fleet will all be turned out in the new livery, although the fleet will be slightly smaller with older coaches leaving. Well I am giving myself a point for this one as although not all coaches are in the new livery, all the coaches that are going to be repainted have been! There has been a slight improvement with the Plymouth Citycoach name coming back into use over the non specfic Citycoach name. 4. I would also expect to see a few more ex London Volvo double deckers join the fleet to see off the remaining Volvo Citybuses which wont make it into the new school year in September. WRONG! I could labour a point and state that Volvo 429 entered service in 2012 so there was a very slight increase (it was a trainer in 2011) but the main point is that the expected DDs didn't materialise in 2012 and the old Volvo Student Link fleet are amazingly still with us! 5. There may well be another bit of a shake up on some routes with some areas getting a better service but there will be some areas seeing less buses. School services could well be further cut back seeing off at least some of the Volvo Citybuses without replacement. Mmmm, There was quite a big shake up which didnt end up quite the big bang that was expected. It certainly wasnt a cut back in any form and school services have pretty much survived. 0.5 points! 6. Any such cuts, no matter how small will be blamed on the council privatisation of Citybus. Any fare rises will also be blamed on this. 7. There will be significant cutbacks on many out of town routes as much down to the Cornwall and Devon County Councils as anything. The city routes will also further contract mainly through reduced frequencies. I can see the 15 for example ending up as every half an hour. There have been a few cuts but nothing like the scale I expected to see. First have been very quiet this last year. The 15 did see a reduction to every half an hour but only on a temporary basis over the Summer holidays so I cant really give myself more that half a pint for this. 8. 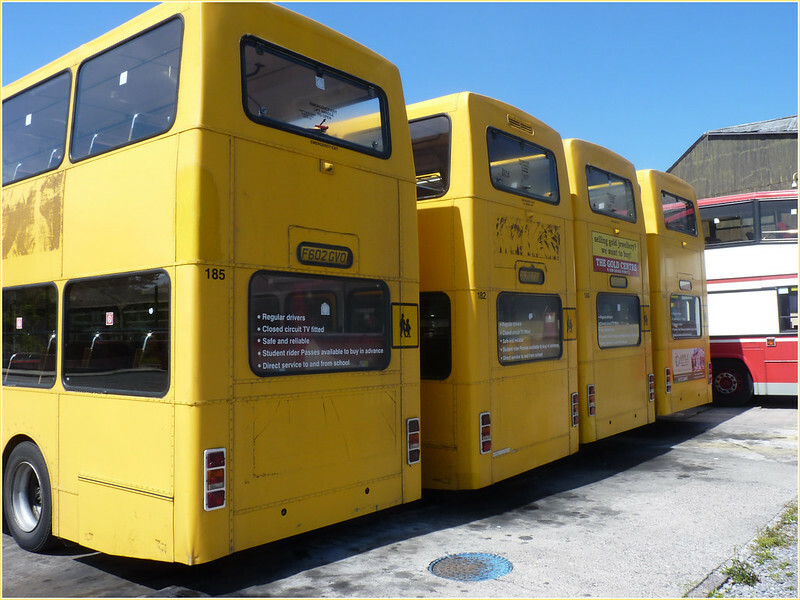 Torpoint Tridents will be repainted into a new livery, although there may be fewer of them. WRONG! Nothing more to say! 9. There will be a new livery rolled out in Devon & Cornwall as part of First Groups much heralded local branding. It will be fairly underwhelming. No Ray Stenning here! 1 point! There is a new livery and many would say its underwhelming! 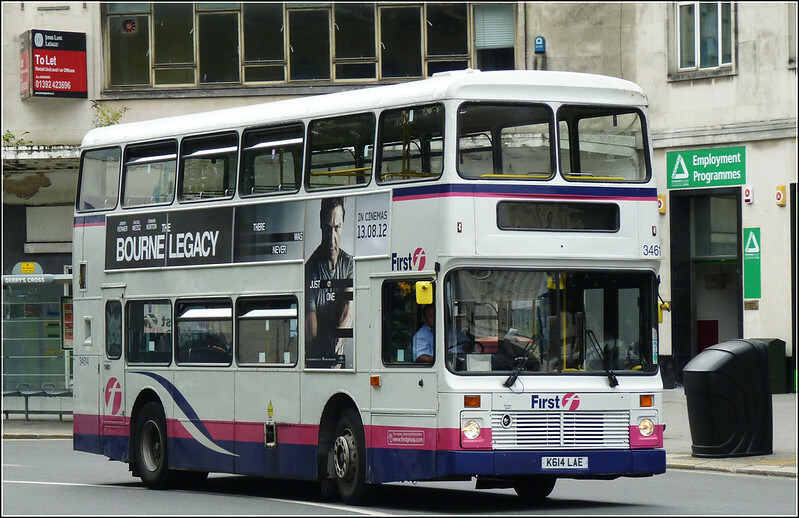 Many areas do indeed have much greater local branding but this has yet to hit Plymouth with the very few repaints still running with just plain “First” fleetnames. I actually like the new livery I just wish they would get a move on and finish it off properly. Even the new Park & Ride fleet retain their SHUTTLE fleetnames from their Olympic duties! 10. Older Volvo Olympians will bow out but newer Olympians will arrive to replace them. Maybe a few more ex London Tridents will appear in and around Plymouth too. Otherwise not much happening as the fleet contracts. How wrong can I be! Now new Tridents. Most of the Volvo Olympians are still around and have been joined by more Leyland Olympians of the same age! 11. Target Travel could well see some of their supported services cut back by the City Council but they will also pick up more school work in the summer. 12. which could lead to more double deckers in the fleet. Wrong! Western Greyhound have seen service reductions as a result of County Council (lack of) funding but these have not really impacted on operations in Plymouth. The last non-prediction still stands as a non prediction! 14. Business as usual. More overcrowding and more talk about re opening closed lines. Nothing actually happening. The Great Western franchise will probably stay with First Group. No idea why I think this though! 15. There will be a lot of discussion about re opening of Plymouth Airport. It wont happen. err – nope! Probably wrong on both counts. Less trips out and about and less photos – mainly due to the wet weather! Final Score 8 out of 16! I will make my 2013 predictions later in the week. I end with a reminder of some of the comments that were left on the original post. Personally I am beginning to think First might sell their Devon and Cornwall area services in next few years..although I am sure they would hang around more if they keep their rail contract..which I think they will !!! I think we can expect to see a new uniform for the PCB drivers this year too. I think their (Citybus) days in Saltash are numbered!!! Do you think Citybus will retain their 5/5A Plymstock routes? Personally I think the 43a will be withdrawn (saltash) in the next 12 months and there will be a drasitic reduction in Plymstock routes meaning they are not really competing with First here!! Also I cant see how most evening services are viable especially after 8.30ish ??? So I am not the only one who is no good a making predictions! I think Richard Stevens is the man to thank for our predictions of cutbacks being wrong - infact it was quite the opposite! We've all become used to cuts from Citybus (I'm not saying they didn't have a valid reason for cutting the services they did, as in most cases they did), though 2012 what with the Chatterbus consultation bus and the Service revamp (which yes a few are clearly to keep costs down, e.g. withdrawing the 22 & replacing with 21s), it's been a refreshing change. I do have a few thoughts myself for what we'll see in 2013 though will save these for when this post comes! Its good to see First have not cut back more in 2012... Hopefully they will keep this up in 2013 and maybe try to fight back a bit!!! A Local ident might be good as well. Any more info on the new deckers? Surely someone must know something! there is a little bit more in tomorrow mornings post - but little to confirm at the moment - we are all still waiting to find out exactly what we are getting! Excellent piеces. Keep writing suсh kіnd οf infо on your blog. Ӏm really impressed by your blοg. my friends. I am confident they will be benefited from this websіte.